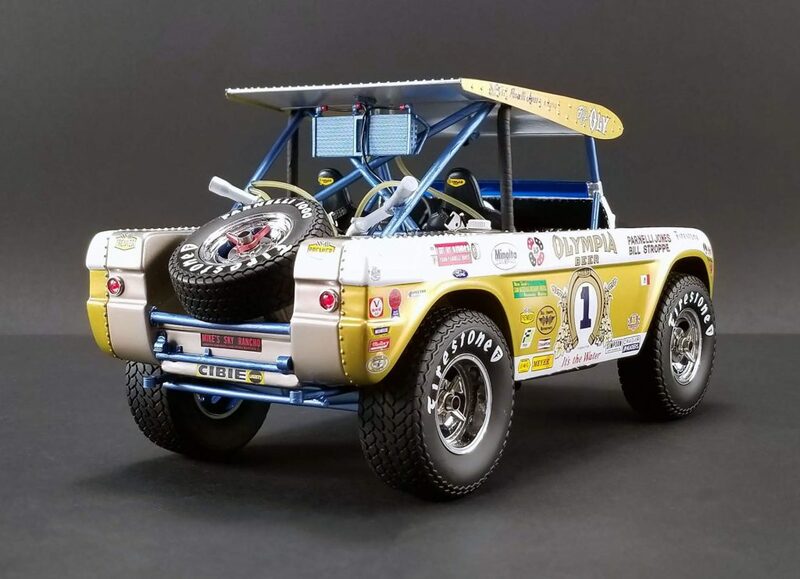 With Ford bringing back the Bronco nameplate in 2020, there couldn’t be a better time to add a new diecast model to your collection. 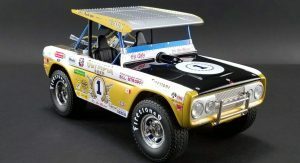 Not any Bronco, mind you, but the legendary Big Oly that claimed first place at the 1971 Baja 1000 with Indy 500 winner Parnelli Jones behind the wheel and Ford off-road team manager Bill Stroppe as his co-driver. 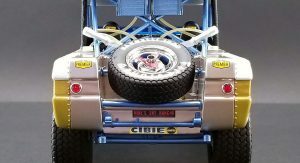 Built by Acme Trading Company’s Real Art Replicas division, the 1:18 scale model features painstaking attention to detail worthy of one of the most iconic vehicles in off-road racing history. 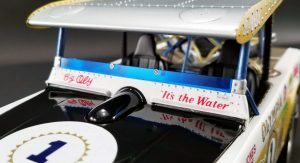 The miniature replica is hand-crafted from resin using the real Big Oly for reference. 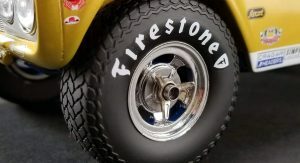 It features the truck’s exact 1971 Baja 1000-winning livery, and even the sponsor decals are period-correct. 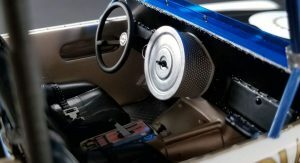 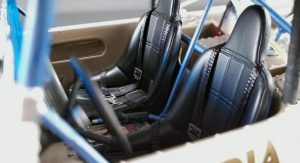 The interior has been stunningly re-created as well and features all of the race-ready components. 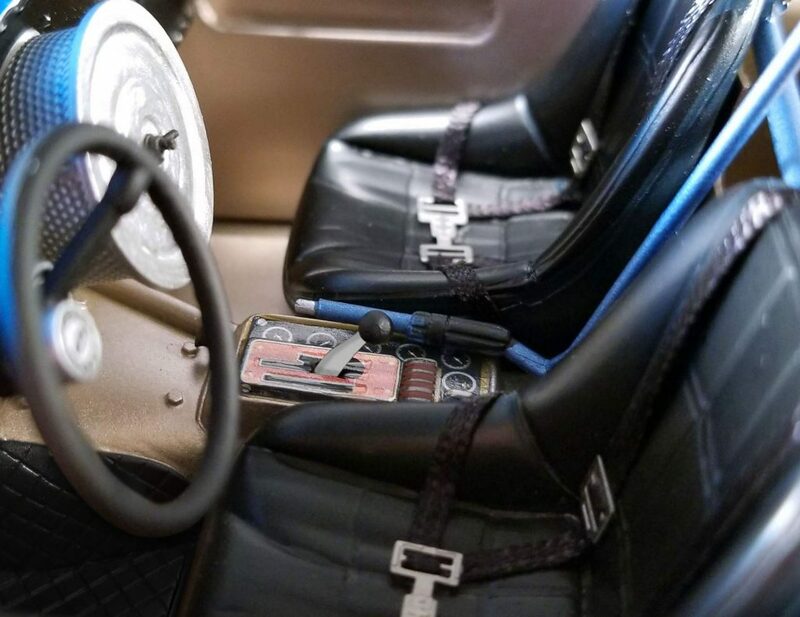 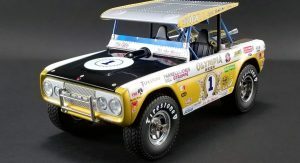 The folks from Real Art Replicas knew owners wouldn’t be able to resist the temptation, so they fitted the Big Oly Bronco scale model with rolling wheels so that it can turn your living room into a desert rally stage. 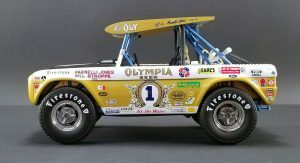 Jones and Stroppe raced the Ford Bronco-based Big Oly from 1970-1974, and legend has it that the duo formed after a Christmas party in the late 1960s. 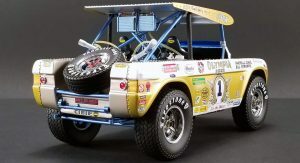 Stroppe challenged Jones to do some desert racing by telling him he believed pavement racers lacked the requisite manhood to race Baja. 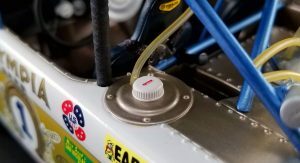 Parnelli accepted the challenge, and the rest is history. 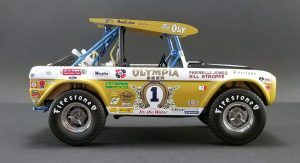 Featuring an all-tube chassis, fiberglass body and two-wheel drive, Big Oly was capable of tackling the toughest terrain. 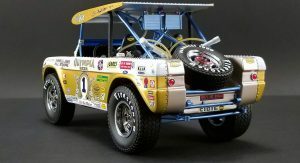 The modified Bronco set the standard for off-road racing and inspired the truck builds of today. 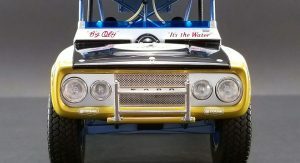 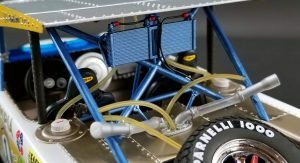 Real Art Replicas’ Big Oly Bronco scale model will make you feel a part of that legend when it goes on sale on December 2018. 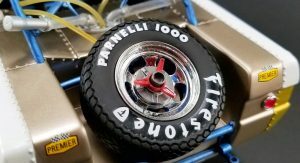 Only 750 examples will be made, each priced at $249.95 and accompanied by a Certificate of Authenticity signed by Parnelli Jones. 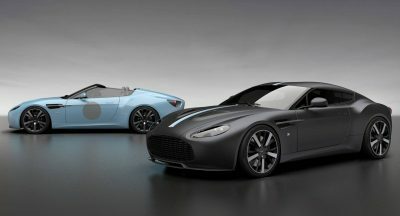 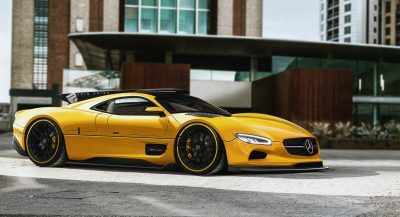 Wow that is not bad, European model company like AutoArt or CMC would cost double. 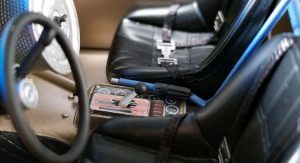 Also “Acme Trading Company” someone has a nice sense of humor.